The handover in the state hotel in Beijing, in the presence of Msgr. Claudio Maria Celli. Pope Francis reportedly asked for this "sacrifice" from Msgr. Guo to save the unity of the Church and to guarantee the signing of the agreement between China and the Holy See. Msgr. Celli also requested the withdrawal of the elderly Bishop of Shantou, Msgr. Zhuang Jianjian. Mindong (AsiaNews) - Msgr. Vincent Guo Xijin, an underground bishop of Mindong, recognized by the Vatican, but not by the government and to date ordinary bishop of the diocese, will leave his ordinary post and give it to Msgr. Vincenzo Zhan Silu, recognized by the government, and one of the seven formerly excommunicated bishops whom Pope Francis has re-admitted to communion. The news was given yesterday by some diocesan priests. According to one of them, yesterday in the afternoon, Msgr. Guo gathered his priests to communicate the new situation in which he now becomes auxiliary bishop. The prelate had just returned from a trip to Beijing where he met with Msgr. Zhan and with Msgr. Claudio Maria Celli, head of a Vatican delegation (see photo). Msgr. Celli presented a letter signed by card. Pietro Parolin, secretary of state, and by card. Fernando Filoni, prefect of Propaganda Fide to Msgr. Guo in which they asked the underground bishop to cede his role as ordinary to Msgr. Zhan. Also according to the report of the priests of Mindong, Msgr. Celli would have told Msgr. Guo that Pope Francis himself asks for this gesture of obedience "and of sacrifice for the general situation of the Chinese Church". Many priests and lay faithful are saddened by this news. In the past, when an official bishop reconciled with the Holy See, and in the same diocese there was an underground bishop, he remained as ordinary and the other, just reconciled, became the auxiliary. In this case the opposite occurred. Moreover, in the case of Mindong there is a great imbalance: out of the more than 90 thousand members of the diocese, at least 80 thousand belong to the underground Church, served by 45 priests, 200 nuns, 300 consecrated lay women and hundreds of lay catechists. The official bishop Zhan counts some members among the faithful and 12 priests who serve in different parishes. According to the report received from AsiaNews, Pope Francis expressed his great appreciation for Msgr. Guo and asked him to personally continue to take care of pastoral care for the underground parishes, but also to find a certain integration with Msgr. Zhan Silu. At the meeting in Beijing, Msgr. Celli also announced that the underground bishop of Shantou, Msgr. Pietro Zhuang Jianjian will give way to the official bishop Giuseppe Huang Bingzhang, also recently reconciled with the Holy See. In any case, the decision to give the ordinary position to the two official bishops, much appreciated by the government, seems to have been already made a year ago, on another trip to Beijing by Msgr. Celli. On that occasion, Msgr. Celli would have explained to Msgr. Guo that the Pope himself demanded this step back "because otherwise the [sino-vatican] agreement cannot be signed". The Pope feared that without the agreement - on episcopal appointments - the Chinese Church would be invaded by dozens of illegitimate bishops, with serious consequences for Church unity. Some priests of Mindong point out that in this way, after 40 years of existence the underground Church will die Others appreciate the extreme obedience shown by Msgr. Guo. According to other priests, with this passage, the Vatican has consigned the Church into the hands of the government. It should be noted that the meeting between Msgr. 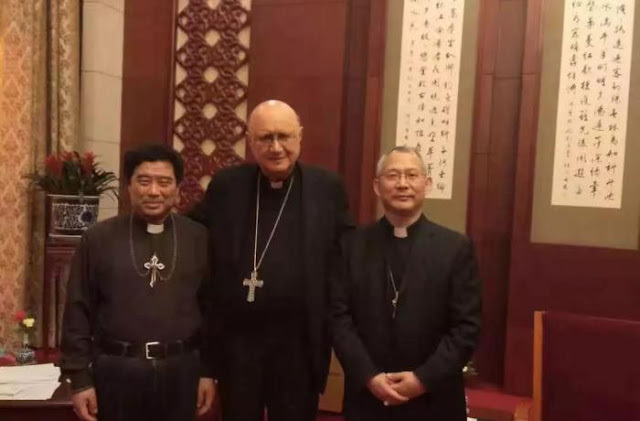 Celli and the two bishops of Mindong took place at Diaoyutai, one of the Chinese state hotels for official guests. One more point remains: in order to be able to exercise his episcopal ministry in an open way, Msgr. Guo needs the approval of the government and the Council of official Chinese bishops.